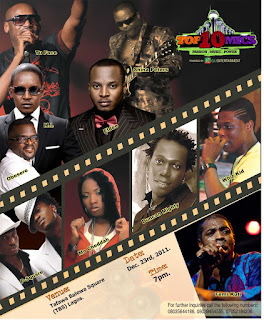 will perform at the highly anticipated concert of 2011, the TOP10 MICS. It would be recalled that on September 9, 2011, KOGA Entertainment, one of the fastest emerging giants in the entertainment industry, released five out of 10 artistes that will be performing at the highly anticipated concert of the year come December 23 at TBS, Lagos. The five acts are African queen crooner, 2face Idibia, rapper, MI, Afro juju creator, Sir Shina Peters, Paramount King of Fuji, Obesere and Trybesmen honcho, Eldee. However, KOGA Entertainment has revealed the identity of the five remaining artistes that will be performing alongside 2face Idibia, Eldee, Sir Shina Peters, M.I and Obesere. Emerging Afro beat legend, Femi Kuti, will be leading the new generation artistes which includes Port Harcourt’s first son, Duncan Mighty, youngster, Whizkid, female singer, Mocheddah and the Okoye twins, P-Square in the concert that has been tagged the concert of the people, by the people and for the people. So, come December 23rd, at the expansive venue, Tafawa Balewa Square (TBS), Lagos, TOP 10 MICS concert will parade 10 leading lights in the Nigerian music industry namely 2face, Femi Kuti, Eldee Tha Don, Sir Shina Peters, MI, Duncan Mighty, Mochedah, P-Square, Obesere and Wizkid. In a concert that is akin to an eclectic collection of different genres of music ranging from hip hop to RnB, afro beat, juju, dancehall, pop, highlife and others. Koga Entertainment is staging a concert that has something for everyone. It is a departure from what is obtainable in concerts in Nigerian entertainment industry as most concerts only carter for hip hop and youth market.